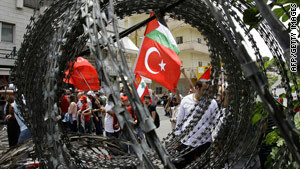 Protesters wave the Palestinian flag while protesting in Turkey earlier this month. Jerusalem (CNN) -- Israel plans to ease its blockade of Gaza, Prime Minister Benjamin Netanyahu said Sunday following an Israeli Security Cabinet meeting, a step commended by major powers and brushed off by a Palestinian organization and government. "The government position is that Israel should open all the crossings of Gaza in accordance with 2005 AMA agreement, and end the closure regime," Palestinian government spokesman Ghassan Khatib told CNN. Tony Blair, envoy for the Middle East Quartet -- the U.S., Russia, the European Union and the United Nations -- said in a statement Israel would publish a list of weapons and war items not permitted into Gaza rather than those permitted, and allow full access of civilian goods. The Security Cabinet said last week it planned to revamp its policy, paving the way for a vote Sunday. Ashraw said the steps were an improvement but the blockade should be completely lifted and the Israeli occupation ended. The latest step is among six the Israeli government will begin implementing as soon as possible, including expanding operations at the existing operating land crossings and streamlining the permitting process of international aid groups the government recognizes, the prime minister said. Blair, who met with Netanyahu on Sunday, said the move should radically change the exchange of goods in the area. "We will work with Israel, the Palestinian Authority, the Quartet and other international partners to ensure these arrangements are implemented as quickly and effectively as possible and to explore additional ways to improve the situation in Gaza, including greater freedom of movement and commerce between Gaza and the West Bank," the statement said. "There is more to be done, and the president looks forward to discussing this new policy, and additional steps, with Prime Minister Netanyahu during his visit to Washington on July 6." "Over these coming months we therefore need: to improve life in Gaza; continue the growth in the West Bank and the PA development of its institutions for statehood; and ensure that the indirect talks, led by Senator Mitchell, turn into full direct negotiations," Blair said. The White House said, "there is no need for unnecessary confrontations, and we call on all parties to act responsibly in meeting the needs of the people of Gaza." Israel, the United States and Blair all called for the release of Gilad Shalit, an Israeli soldier who has been held in Gaza for nearly four years. "We will redouble our efforts to secure his freedom," Blair said. Separately, Germany criticized Israeli officials for denying Dirk Niebel, German minister of economic cooperation and development, entry into Gaza. "The goal of the federal government remains the complete end of the blockade Gaza Strip," German Foreign Minister Guido Westerwelle said in a Sunday statement. "That is not only Germany's stance but also that of our partners in the European Union." Yigal Palmor, spokesman for the Israeli foreign ministry, said Neibel was not allowed to enter Gaza because "Hamas uses visits of this kind for purposes of manipulation and misrepresentation of international legitimacy and normal relations with the international community." Israel's policy of denying high-ranking diplomats access to Gaza -- in place since last year's Israeli incursion into Gaza -- has angered European governments which finance various programs in Gaza. Israel made an exception earlier this year, when it allowed United Nations Secretary-General Ban Ki-moon and Baroness Catherine Ashton, EU foreign policy chief, to visit Gaza. CNN's Guy Azriel, Kareem Khadder, and Ben Brumfield contributed to this report.